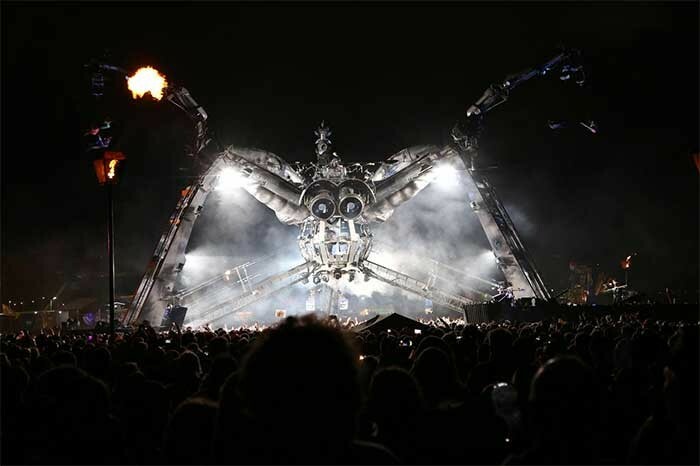 Avolites Media's industry-leading Ai infinity 8 Server with 8 Full HD outputs has powered the video mapping of a giant robotic Spider Stage at this year's historic Glastonbury Festival. 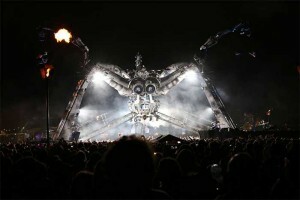 The 30ft Spider Stage, constructed by 'sculpture-based organisation' Arcadia, featured eight metal legs surrounding a core-like DJ box, all of which were intricately video mapped by Ai Infinity 8 via a mixture of pre-programmed sequences and live-control. "Video mapping such a complex construction should have been extremely challenging, especially as we were stationed in the round with only one side visible from any viewpoint," explains Dave Green, technical director at Immersive and head of development at Avolites Media. "However we tackled this using the auto map feature of Ai over VNC from a variety of points around the structure." Using the Infinity Ai Infinity Media Server, as well as Avolites' Sapphire Media and Sapphire Touch platforms, the Immersive team programmed and virtually rehearsed the video animation; lighting looks and laser positions offsite. "It took over two weeks of preparation with the Arcadia team close by with art direction throughout," continues Green. 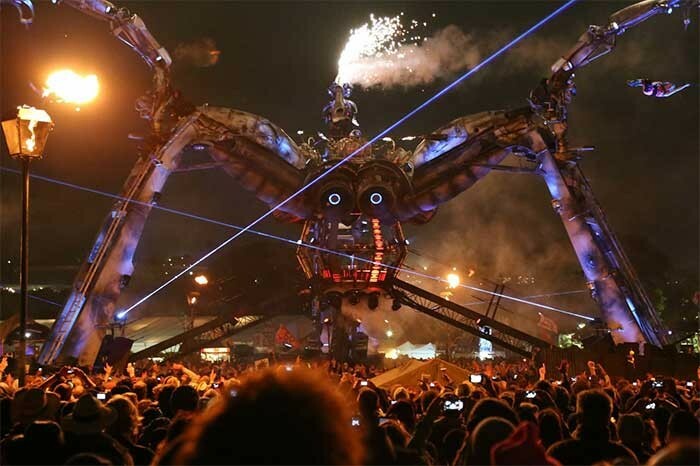 "Once on-site, with the obvious time restrictions involved setting up at Glastonbury, we managed to intricately map the entire show to the spider construction in under four hours." The variety of performances at Arcadia's Spider Stage demonstrated the powerful flexibility of Ai Infinity 8, not only in terms of the number of elements involved but also in the transition from the pre-programmed segment to the live performance. As soon as the time-code ended, the audio and visual performances switched over to live, with DJs, VJs and LDs taking control of the system. This was no issue for the Ai Media Server, which ensured the switch between pre programmed and live busking was seamless. Green elaborates: "Once the choreographed show finished it was rave time, and that was all busked live. That's one of the nice things about our system actually - it's very good for doing pre-programmed content and it's also brilliant for taking care of live stuff. A lot of the other systems don't really have that intuitive live thing going on." Ai is designed from the ground up with both pre-sequenced and live control in mind, which enables the operator to seamlessly mix between a time-coded show and an improvised live performance – this was essential on Arcadia. In addition the Sapphire Media control surface is designed for shows that demand an extremely flexible interface that can be tailored to the show's requirements, while also showing previews of all of the eight outputs from the system. These outputs can be monitored while operating the show or installing/mapping the structure. "Each Ai offers eight HD outputs and delivers smooth playback of multilayer 8K media, using the AiM Codec and 32 media layers," continues Green. "Features include soft-edge blending of multiple projectors, timeline and time-code sequencing, support for 3D displays and remote vertex adjustment. Users can map and warp onto any 3D surface and on moving scenery. Intuitive modular LED support also widens the capability further." Steve Warren, managing director for Avolites Media is delighted: "Arcadia demonstrates collaboration at its very best. I feel honoured to be able to work with such creative teams; the artistry produced by Jaz Bhullar on lighting and the video content from Blinkin Lab, Tom Wall, was magical. It's great to know that the successful realisation of their work was made possible with the efforts of the Avolites Media team, Immersive and Video Illusions. Arcadia's Pip and Bertie have both been appreciative, supportive and 100% focused on the highest show values. Together we truly delivered the 'spectacular' in the Arcadia spectacular."